Onceyou have contacts, they might like to see a picture instead of just your initials. Touch the circle with your initials (or profile picture if you had already set one), and a list of options appears. 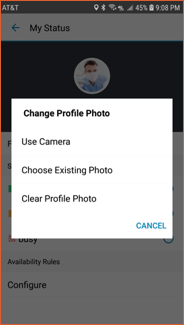 You can use your phone’s camera to take a picture to use, choose an existing phone or clear your current profile picture. 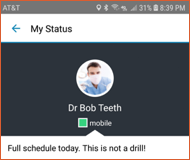 If you have a status message, type that into the “What’s on your mind?” field. This will show to others when they view your profile. Useful messages might be “Working from home today”, “Working from the gym today” or “Working from the beach today”.